There can be no doubt that this car holds the key to driving nirvana. In truth it is the only true M-Power car apart from the M1. All M-Power cars that followed were basically just highly tuned versions of their smaller brothers. We remember very well our belief that any modification of the original could not possibly make a better driving experience, and to some extent, that belief was proven to be true. However, Hartge did indeed provide a raft of modifications to this car, from a "moderate" 240hp conversion, all the way up to the mighty H36, a tuned M6-engined monster with 330hp in export trim. 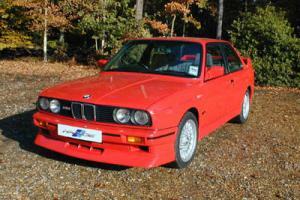 We recall the sticker prices of £49,000 for the complete car, which made everyone wince a bit. Still, as time went on, used ones could be found, and we eventually bought one! That car is still driven today, as it happens, by a very, very happy Birds customer. Back in the real world, we carried out dozens of 240hp engine conversions, more than 50 Right-Hand-Drive conversions, (many for BMW main dealers), and of course lots of suspension and wheel upgrades. Sadly, the demand of the market now is either for restoration work (either mechanical or cosmetic) so we rarely get to play with these fabulous driving machines anymore..... But we do seem to sell a lot of Quaife ATB limited-slip differentials to replace the worn-out ZF clutched diffs.